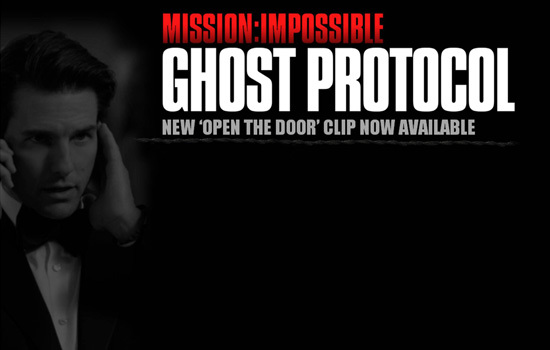 MISSION: IMPOSSIBLE- GHOST PROTOCOL, Getting Vertigo in IMAX! Before filming began on “Mission: Impossible-Ghost Protocol”, Tom Cruise, J.J. Abrams and director Brad Bird met with Paramount about shooting 25 minutes of the film in IMAX. He stated it is slightly less than the Dark Knight. Bird stated that while watching snipets of the film “people are getting vertigo because the screens are too big they actually feel they are going to tumble into them…the more you can make it like a dream, and like reality that’s what you’re going for.” Bird stated that he wanted to sweep people away. “I wanted people to see this at it’s best,” said Bird. “Mission: Impossible-Ghost Protocol” opens five days early on December 16 in IMAX before it’s wide release on December 21, 2011.